The bald eagle patient, thought to be male, that was injured near Duluth, was seen for a routine clinic check up today. 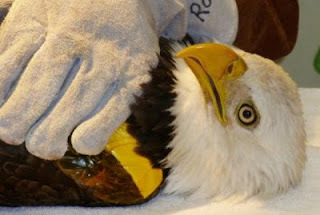 The puncture wounds were cleaned, and the bird's weight and other vitals were taken, among other things. 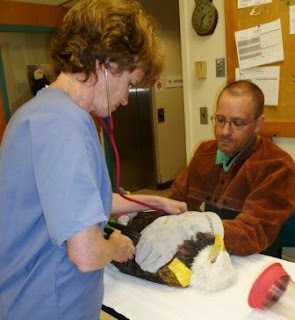 The Raptor Center is proud to play a vital role in conservation research and veterinary medicine. As with all of our patients, each one brings a new piece to the overall body of knowledge we continue to build on species. Every individual is a lens to their population with an opportunity to gain more understanding, or ask different questions.